This podcast was recorded at our forum “Making International Pathways” on 4 August, 2017 at Slow Clay Centre. The speakers were Penny Byrne, Greg Daly and Dean Smith and MC Dr Kevin Murray. Slow Clay Centre director, Jane Sawyer, starts the evening by introducing Kevin Murray and concludes the recording with thanks to the speakers and to all for attending. The format of the event was an introduction by Kevin Murray setting the stage for international engagement, followed by each speaker who showed slides and presented their pathway (sadly we cannot show you their presentations!). The panel was followed by a Q&A with the audience. Some questions to consider were: In these times of thinking locally, what is the value of thinking about international opportunities? Is gallery representation necessary to be seen internationally? What value is social media? 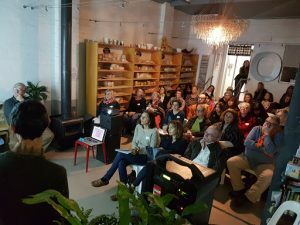 We hosted this event in conjunction with Garland Magazine, The World Crafts Council – Australia and the annual Craft Cubed Festival presented by Craft Victoria. It was a full house and we encourage you to keep an eye on our newsletter and web site for future forums!